US online retail continues 17% to 20% year-over-year growth! Today turned out to be an unusually interesting day for three reasons. First, the U.S. Census Bureau released its latest E-Stats Report for FYE 2010 today, which revealed that online retail reached $169 billion for all of 2010. The Census Bureau data point does not include online auctions or marketplaces. If you add in eBay’s 2010 U.S. Gross Merchandise Volume (GMV) of $20.4 billion, total online retail could be estimated at approximately $190 billion for FYE 2010. The E-Stats Report also includes preliminary estimates for online retail in 2011 of approximately $194.3 billion. Once again, if you add eBay’s 2011 GMV of $22.8 billion, total online retail could be estimated at approximately $217 billion for FYE 2011. Second, today comScore released Q1 online retail statistics, which say that online spending in the U.S. reached $44.3 billion (excluding auctions), an increase of 17% over last year. Interestingly, comScore will be hosting a free webinar to review their data in detail—including recent trends toward “showrooming” (in which a buyer goes to a bricks-and-mortar store to compare different items, then leaves the store and purchases online to avoid sales tax). Finally, today Internet Retailer released their annual Top 500 Guide. As usual, Amazon tops the list with $48 billion in sales. An interesting data point in the annual ranking includes the dramatic range in revenue from the top of the list to the bottom. At number 500 is Summit Sports with just under $15 million (0.00024% of eBay’s sales volume). 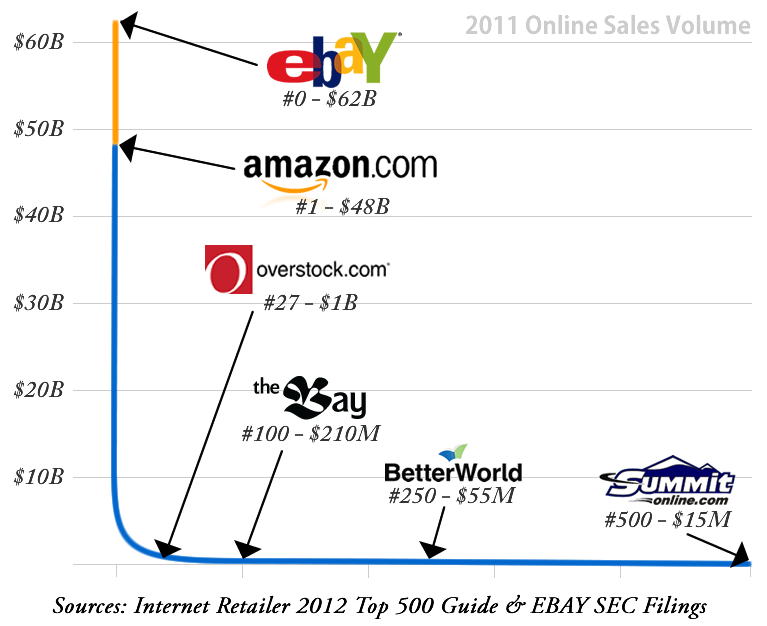 We have always thought it notable that eBay is not included in this list. We understand that as a marketplace operator, they are not the direct retailer; rather, they aggregate millions of sellers under one roof. However, if eBay were included on the list, based upon only their marketplace and GSI business units (excluding PayPal), they would beat even Amazon with $62 billion in GMV in 2011 (worldwide). Here’s an interesting observation about the census and Internet Retailer data. The total online commerce represented in the Top 500 list—which, you’ll remember, ends with a retailer that had just under $15 million in sales in 2011—was $150 billion in 2010. However, the census data reports $190 billion for 2010. That year, the retailer at the bottom of the Top 500 list was MagnetStreet with $11 million. Since the census figure includes all retailers while the Top 500 figure includes only retailers with more than $11 million in annual sales in 2011, we now know how much businesses with less than $11 million in annual sales generated together in 2010. In other words, because it didn’t count businesses with less than $11 million in annual sales in 2010, the Top 500 list only accounted for $150 billion in total ecommerce sales in 2010 instead of $190 billion. That’s $40 billion in ecommerce being transacted by merchants with less than $11 million in annual sales! It’s also important to remember that the IR Top 500 Guide is not restricted to US sales but includes all sales worldwide. So there could be considerably more than $40 billion in ecommerce that’s still under the radar. There are a lot of conclusions that could be drawn from this, but we’ll save those discussions for another post at a later date. Tennessee and Amazon have agreed to a deal similar to the one between California and Amazon. 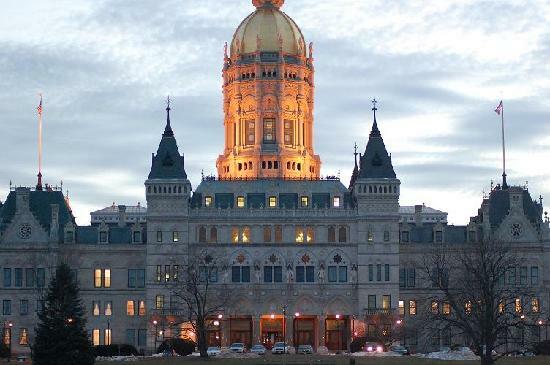 This deal requires Amazon to begin collecting sales tax for the state in 2014—unless federal legislation on online sales tax has passed by then—and the company will create 3500 full-time and several thousand seasonal jobs in the state. This Missouri News Horizon article has the details. The new agreement is a dramatic shift from the original deal struck by the state with Amazon, in which former Gov. Phil Bredesen and his team evidently agreed to allow Amazon to forego collecting sales taxes in exchange for creating hundreds of jobs with distribution centers in Hamilton and Bradley counties. Haslam had agreed to honor that original deal, and state officials Thursday insisted the new agreement does not mean the state has gone back on its word. . . .
Haslam said the agreement applies unless a national solution, which would bring all states under the same framework on state sales tax collections, comes first. Many people believe Congress should act to make application of sales tax law the same for online and traditional retailers. The Amazon executive said his company supports efforts to streamline sales tax collections nationally. “The sales tax issue must be resolved in Congress,” Misener said. “It’s the only way the state of Tennessee will be able to retain all the sales tax revenue that can be collected for the state. With all this vocal support for the Main Street Fairness Act from both Amazon and state legislators, there seems to be a general consensus that federal legislation is the best solution for everyone. But in its absence, states will do whatever they can to try to make sure sales tax is collected online as well as in local stores. We hope Congress is noticing the rapidly increasing support for the Main Street Fairness Act among state legislators. These are the people who work where the rubber meets the road and know exactly what their states and communities need to function properly. Unfortunately, in this case they are not the ones who have the power to make sure states and communities get what they need. That’s Congress. But members of Congress need to listen to what local and state legislators are telling them and then put their support behind Main Street Fairness Act. Other states, though, might not be in a position to get the same deal as California. For one thing, Amazon had more of a presence in that state than simply a bunch of affiliates. The company had several wholly-owned subsidiaries in California, which made it tougher for the company to claim that it lacked a physical presence. For now, Amazon isn’t indicating that it will offer other states the same deal it offered California. But the company is saying what it would like to have happen next: a federal solution. “We’re committed to working with Congress, retailers and the states to pass federal legislation as soon as possible,” Paul Misener, Amazon’s vice president of global public policy, said in a statement after Brown signed the law. That isn’t a new position. Amazon’s case has long been that it isn’t against collecting sales taxes, so long as a federal deal also makes collecting the taxes less burdensome. That’s actually what most state officials want, too. Legislation in Congress known as the Main Street Fairness Act would require online retailers to collect sales taxes in the state where a purchase is made, but only if the state is among those that that have made their sales taxes more uniform through an interstate collaboration known as the Streamlined Sales and Use Tax Agreement. With Amazon, Walmart, Target, and many more major retailers (not to mention the Retail Industry Leaders Association) all joining state legislators from both sides of the aisle in supporting the Main Street Fairness Act, surely the bill’s time has come. The other reason for doubt is that Congress has struggled to forge compromises on all big issues lately. A proposal that would result in more taxes being collected—even if the taxes are legally already owed—will be an especially hard sell, even if the failure to pass it will likely result in a new round of messy fights between states and online retailers. If these are the only arguments standing in the way of the Main Street Fairness Act, then we take heart. There are reasonable answers to these objections. First, the notion that “the Main Street Fairness Act is harmful for small online retailers”: It’s really not. Technology has reached the point that today, it’s no more difficult to collect sales tax online than to calculate shipping rates. Look at TaxCloud, a comprehensive sales tax management service that’s available at no cost for retailers. With services like TaxCloud available—again, at no cost—there’s no reason for any retailer, no matter how small, to find it difficult, costly, or burdensome to collect sales tax. Second, there is this scare statement that “the Main Street Fairness Act is a hard sell in Congress”: We disagree. While it is easy to simply say things like “it will never happen” or “Congress is too divided,” nobody in Washington DC is saying that about this issue (except for the ATU and NTP). In fact, it’s one of those rare bills that has bipartisan support. It may have been introduced by a Democrat, but it has lots of Republican supporters, among them Senator Bob Corker (R-TN), Senator John Boozman (R-AR), and Tennessee Governor Bill Haslam (not to mention all the Republican supporter in state legislatures, such as Luke Kenley (IN) and Evelyn Lynn (FL), to name just two). We think that once hard facts overcome all the inflammatory rhetoric about the Main Street Fairness Act, voting for it should be a pretty easy decision. The Stateline article is well worth reading in its entirety for its thorough summary of the arguments for and against online sales tax collection. Just keep in mind that the arguments against it aren’t the last word.